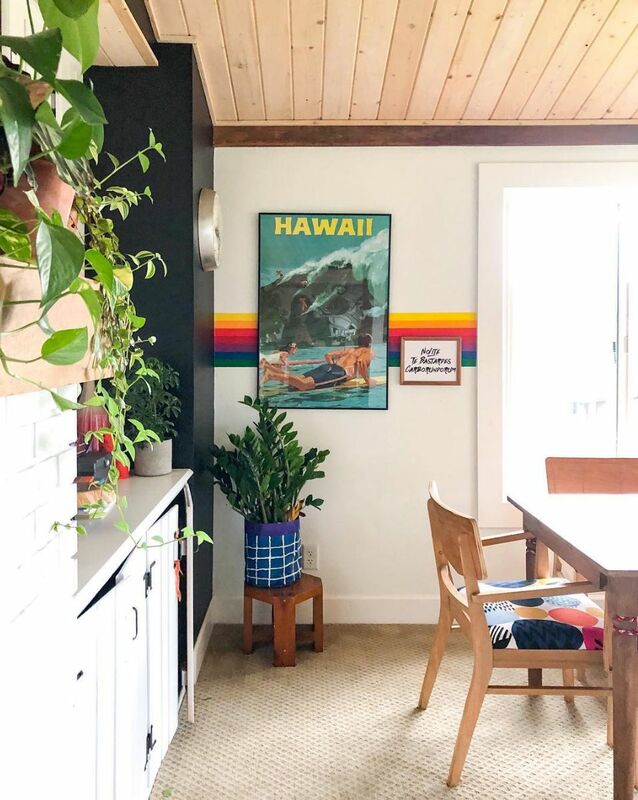 Nearly every room of her Vancouver, Washington abode is bursting with color. 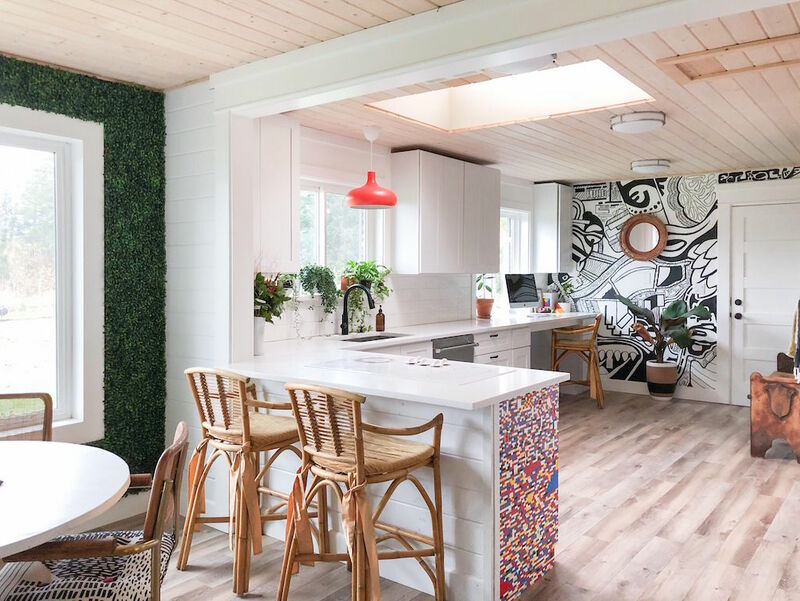 There’s the rainbow stripe that wraps around her living room (inspired by a $5 thrifted bedsheet, no less), the insanely intricate mural of her husband’s artwork in the kitchen, the color-blocked master bathroom design, a LEGO-adorned kitchen peninsula, and so much more. 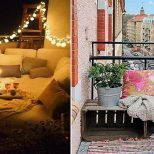 “With a little creativity and a few bucks (literally, a few) you can transform a space!” says the avid thrifter and DIY-er. Here Jackson shares a few tips and tricks that will convince you to tackle the creative paint project that’s been pinned to your vision board for far too long. “I draw inspiration from literally everywhere!” says Jackson. “Bedsheets, thrifted clothes, Pinterest, Instagram — my 7-year-old comes up with some pretty rad designs on the back of his math homework.” Search relevant hashtags (#crashbangcolour is a good place to start), scour your favorite design blogs, or check out that trendy coffee shop your friends are always posting about. “I absorb as much as possible, and then eventually something just clicks,” notes Jackson. 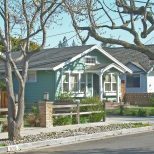 “I try to use the same color palette throughout my home. 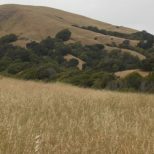 It varies, of course, room to room — but I feel like this way, the rooms flow,” explains Jackson. She opts for thrifted furniture in classic shapes that are less susceptible to wavering trends. 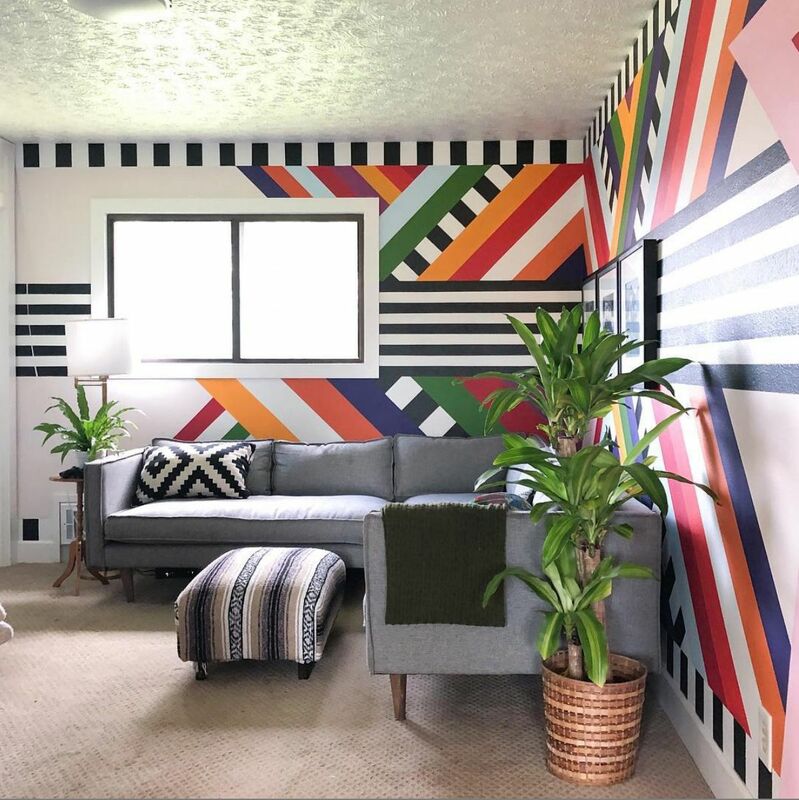 “I try to keep the color on the wall because paint will always be the cheapest thing to change, and my mind and taste change all the time!” In her media room, for example, she balanced out a flashy wall mural with a neutral sofa and lounge chair. “The other walls are white so your eyes have a place to rest,” she adds. “Hardware stores sell sample pots of paint for around $3,” says Jackson. “If you want to go even cheaper and are flexible on color, you could check out the section of returned/discounted paint.” If you’re overwhelmed by the gargantuan display of paint chips, Jackson suggests drawing inspiration from your existing decor: “Buy a couple colors that excite you and complement your wall color.” Before you check out, be sure to pick up a paintbrush and garbage bags to use as drop cloths (although Jackson says old sheets work just fine, too!). “Just do it! You really just need to break the seal,” says Jackson. 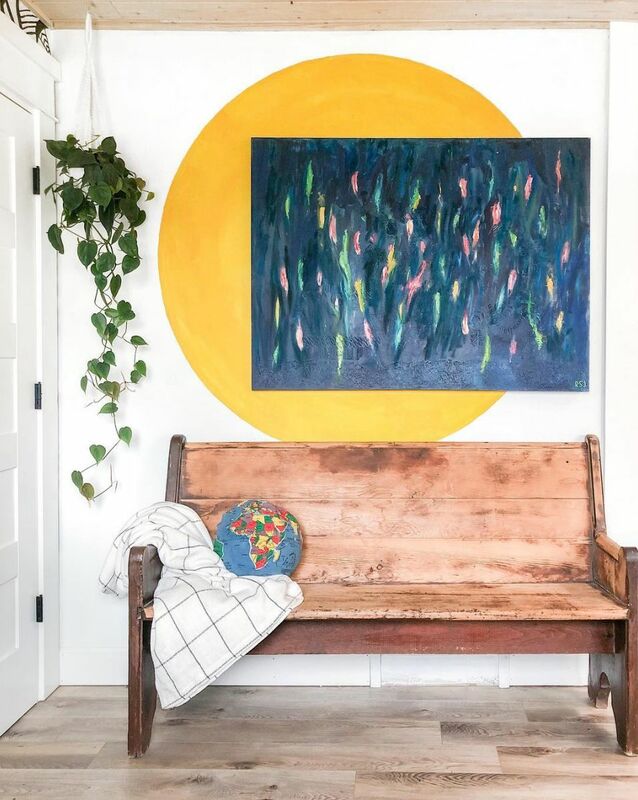 “I know it seems intimidating, but it doesn’t take a pro to do this.” Jackson has completed both 20-minute projects (a large yellow circle behind a bench in her kitchen) and 60- to 70-hour feats of endurance (the aforementioned media room mural). 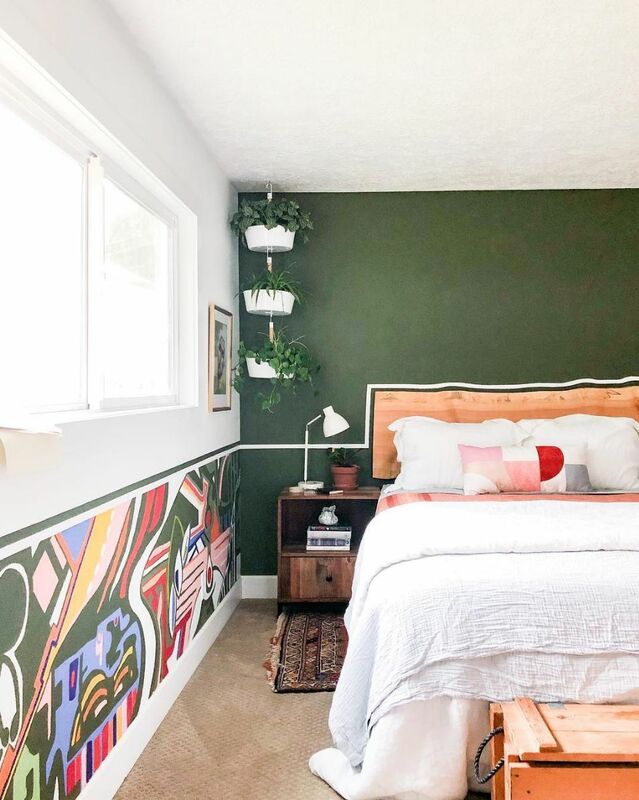 While it can be mildly terrifying to pick up a brush as a novice, Jackson’s rainbow-hued home is proof that paint can be totally transformative.